Keynesian economists believe government spending on "shovel-ready" infrastructure projects - schools, roads, bridges - is the best way to stimulate our staggering economy. Supply-side economists make an equally persuasive case that tax cuts are the surest and quickest way to create permanent jobs and cause an economy to rebound. That happened under JFK, Ronald Reagan and George W. Bush. We know that when tax rates are cut in a recession, it brings an economy back. One of the great things about our show is diversity. Tonight's a perfect example! We start with former President Jimmy Carter. We'll talk Pres. Obama, peace in the middle east (or the lack thereof) and all things current. Then Mickey Rourke! He's in a movie that's getting a lot of buzz, "The Wrestler." We'll also ask about his battles behind the scenes and how he's managed to resurrect his career. And, we're also still reading your comments from Larry's interview with impeached Illinois Governor Rod Blagojevich! We asked for comments and you delivered. Want to sound off on Larry's interview with the governor? CLICK HERE! TORONTO - For a few days at the Toronto International Film Festival in September, where Mickey Rourke’s “The Wrestler” stunned audiences and started a bidding war, the onetime pretty boy/movie tough guy could be seen shambling around swanky Yorkville, his 17-year-old miniature Chihuahua, Loki, snuggled in his arms. There Rourke was, all 52 bruised and battered years of him, his mop of hair streaked blond, his face puffy and battle-scarred from his storied stretch (‘91-’95) on the pro boxing circuit. Open collar, pinstripe suit, fancy shoes — the guy who used to sell as many postcards as James Dean and Marilyn Monroe in European souvenir stalls, taking the noon air with his pooch and his personal assistant/cook/friend and fellow Chihuahua owner, J.P., in tow. 8:00 PM (all times eastern): since the face of the LKL Blog David Theall is in New York today, I'll be doing tonight's live blog. I'm Michael Watts, an LKL supervising producer based in DC. I've been reading your comments througout the day. A lot of smart stuff in there. It's been especially interesting to me how many Illionois residents have already chimed in. Please continue adding your comments to this post, or the post below, and keep checking in through the end of the show for updates. 8:55 We're looking for some good questions from you for the governor tonight. Please put them in and we'll get to as many as we can. 9:07 So the governor is saying one of the reasons he's not participating in the impeachment trial is because he can't call witnesses. Do you think this is fair? 9:12 When asked about the quotes from the recorded conversations cited by U.S. Attorney Fitzpatrick , the governor didn't respond to the specific quotes. He did say though he is anxious to hear the tapes and hopes they'll be played during the hearings this week. Don't know about you, but I can't wait to hear those tapes. 9:26 Very interesting. Governor said he expects to be removed from office in the next few days. 9:35 Not sure what made me think of this, but I wonder if Sen. Burris is watching tonight? 9:45 I'm enjoying reading your comments, not something I usually get to do. How do you all feel the governor is doing? Do you find him convincing? 9:47 Just used one of your questions on air. Looking for more so keep 'em coming. 9:54 Many of you have asked about the Children's Hospital and Wrigley Field allegations. Larry planning to ask about that in the next segment if we have time. 10:00 Very interesting show and it's been really fun reading your comments. Keep the conversation going and we'll be looking at your comments throughout the night. Thanks for watching and thanks for blogging with us. WASHINGTON (CNN) - Promising to return America to the "moral high ground" in the war on terrorism, President Obama issued three executive orders Thursday to demonstrate a clean break from the Bush administration, including one requiring that the Guantanamo Bay detention facility be closed within a year. Answer our "Question of the Day" about Guantanamo Bay detainees HERE! LKL "Question of the Day!" President Obama issued an executive order to close down Guantanamo Bay detention facilty within a year. The Pentagon reports 245 detainees/enemy combatants are presently housed at GITMO. WHAT SHOULD BE DONE WITH THOSE BEING HELD AT GUANTANAMO BAY DETENTION FACILITY? Sound off and tune-in tonight to "Larry King Live," at 9 p.m., ET. We just may use your coment on the air! CLICK HERE to answer our "Question of the Day." Democrats hold a strong majority in Congress, but with power comes a power struggle, and a potential headache for President Obama. 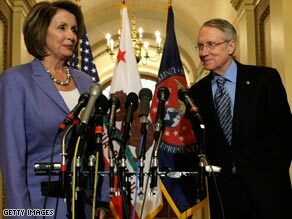 House Speaker Nancy Pelosi and Senate Majority Leader Harry Reid have made it clear - it's not their job to answer to Obama. To a certain degree, the president-Congress tension is simply politics at play - something that happens every time a new president comes in.